For the past two years, President Abdel-Fattah El Sisi has emphasized religious discourse as part of his central message, asserting the state’s religious and moral authority in the wake of public backlash and a crackdown against Islamists that has dominated the country’s political theater. “You are the one responsible for religious discourse, and God will ask me whether I am satisfied or not,” he said in July comments directed to the Grand Imam of al-Azhar. This was a reiteration of sentiments the president had shared previously on a number of occasions, most prominently in January when he called for a “religious revolution,” to the glee and praise of some foreign observers. However, the praise Sisi receives for these comments, even on an international level, seems to be at odds with what his government has done, which looks more like an emboldened version of the statist approach to religion that has long been adopted by Egyptian regimes. While the president has encouraged the criticism of some Islamist ideologies prevalent in Egypt, he has made it clear that al-Azhar is off limits to those outside the government fold. “The one who undertakes this role [a religious revolution] is the institution of the state,” said Sisi in a speech in April. His remarks were largely seen as a response to Islam al-Beheiry, a television presenter who has criticized both al-Azhar and ideologies promoted by Salafist groups. Al-Azhar has already filed a criminal complaint against the host, resulting in Beheiry’s conviction on blasphemy charges. Meanwhile, the Ministry of Endowments has launched a campaign to battle the threats of Shi’ism, atheism, and Baha’ism. This has come with strict regulations for Friday sermons, limiting where they could be made and by whom, and the ministry has attempted to regulate smaller places of worship, where ideologies deviating from the dictated talking points could potentially take root. For those who were hoping for an Egypt more open to religious minorities and for the country to step away from conservatism, there were some good signs. The constitution passed under former President Muhammad Morsi was suspended and a new one was drafted; the new charter left out the controversial Article 219 that Islamists strongly pushed for and included in the previous constitution. The new draft also included a transitional article that mandated that the new parliament (which has not yet been elected) issue a new law to regulate the construction and renovation of churches, a promise to the end of the legal difficulties Christians face when wanting to do either. Sisi also became the first Egyptian president to visit the Coptic Orthodox cathedral in Abbasiya during Christmas services, a symbolic gesture that many saw as an important distinction from his predecessor, whose group too often engages in sectarian rhetoric against Christians and other minorities. The progress of Christians, however, cannot be gauged within the urban bubble of Cairo, or even the legislation passed by the national government. Sectarian attacks continue, mostly in rural areas, and the security apparatus has dealt with such offenses in the same manner they did before January 25 and in its aftermath. 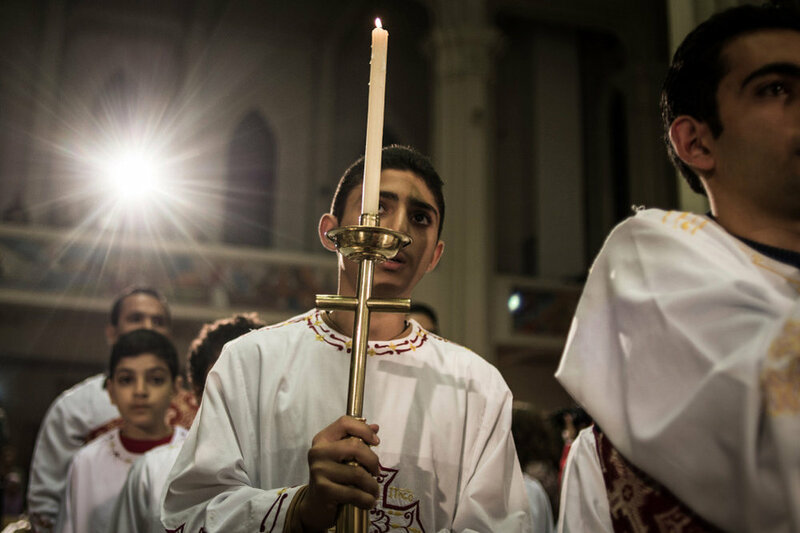 Important issues still remain regarding Egyptian Christians’ participation in the higher echelons of power across a wide range of government institutions. Contempt of religion is still a jailable offense—something that affects both Muslims and Christians, but has been applied disproportionately to the latter. Sisi’s intentions for his proposed religious revolution do not factor into the feasibility of his spearheading such an effort. He is a strong proponent of a statist religious policy, and given the polarizing position of the Egyptian state (not only domestically but across the whole region), it is not likely to be the vehicle for an ideological shift. Sisi will surely continue receiving votes of confidence from his vocal supporters, and his position of power gives him more influence over a narrative than anyone else in the country. Nonetheless, the president’s religious policy, rather than being driven by ideology and principles, will be calculations of his political challenges. The true independence of al-Azhar leadership, once the most influential religious institution in the region, will continue to be questioned by many. The current situation is not completely similar, as the media and political factions have found it easier to engage in effective public campaigns against the Brotherhood. Nevertheless, Islamist groups provide unique challenges for governments, which feel the need to counteract the religious discourse of groups like the Brotherhood, which can carry populist appeal. Sisi’s Islamic opposition has been quick in attempts to discredit Sisi’s regime on religious grounds. Sadat’s answer to the Islamic revival of his time was loosening the noose on Brotherhood political participation and coopting aspects of the general Islamic trend that resonated with citizens. Sisi, on the other hand, is still leading a brutal crackdown on the Brotherhood and other Islamic groups, and his regime has been mainly focused on excluding them from political and public life. However, that has not stopped him from seeking moral legitimacy through state religious institutions (like al-Azhar and the Ministry of Endowments) and already existing measures to regulate moral affairs. At the same time, calls for a religious revolution should not be confused with a true paradigm shift in the way the Egyptian state deals with religion, but simply a reassertion of business as usual if it continues to deal with the government’s problems concerning religious discourse and its balance between using religion to stifle opposition. Those familiar with the dynamics of modern Egypt knew that the end to the Brotherhood’s short rule would not come with a counteracting move towards secularism. In the absence of a real shift in discourse and equal rights governed by the law, Sisi’s so-called religious revolution will not lead to real, desired change if it continues to rely on the same paradigms and power structures that played a role in permeating and fomenting the political and religious divides that have brought the country to its present condition.